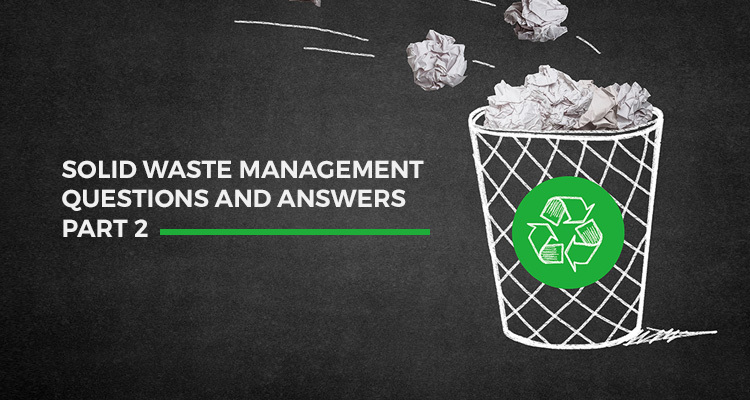 As we are continuously dedicated to manufacturing high-quality products and providing professional service in the niche of a waste management, in this article we bring you the second part of the most frequently asked questions about the solid waste disposal. Solid waste management includes collecting, sorting out, treating, and disposing of the solid materials that are no longer in use. Therefore, it is of high importance to create a h3 strategy for a municipal waste disposal in order to prevent the environmental pollution and unsanitary conditions. In the Part 1 of our solid waste management Q&A session we covered the issues of the difference between plastic and metal waste containers, the proper way of dealing with a disposal of fire ash, finding the best possible waste containers for residential areas, question of a skip hire services, and a dilemma about locking a waste container or not. In Part 2 we tend to answer other questions we usually get from our prospective customers. Here, we bring up the issues of the proper dealing with municipal waste and construction debris, potential risks of hazardous waste, best solutions for bringing the recycling system to a higher level, and finding the right bins for preserving green areas. #1 What is the proper way of municipal waste disposal? People used to throw their garbage in the streets outside their home, as it was a common practice in the 15th century, but those days are long gone. Today, one cannot just go outside and throw the trash wherever they feel like it. And of course, it is up to city authorities to provide enough bins for residential areas. Solid-waste management is a set of complex issues, ranging from technical, administrative, and social challenges that need to be approached in the right way. Therefore, equipment should be carefully picked. Containers for a municipal waste collection should be provided according to a community’s size, population density, and other demographics. Usually, having two 660 to 1100 litter bins per a smaller street might be considered as a proper way to treat municipal waste. Simetimes, though, steel sideload containers of a cappacity from 2400 to 3200 liters can be used for bigger areas. #2 What about hazardous waste? Is it allowed to throw it in a trash can? Toxic waste can range from a disposal of paint leftovers after a home renovation to a hospital waste to industrial byproducts that might contain dangerous chemicals. Although the hazardous waste can be liquid, solid items appear quite often as well. What can you do about it? Please have in mind that households can raise the potential risk by putting off dangerous items into the municipal waste containers. It can happen if someone throws away batteries, light bulbs, electrical appliances, fluorescent lamps, aerosol spray cans, expired pharmaceutical drugs, or any other potentially toxic materials. Legal regulations often require a special treatment of hazardous waste. It needs to be handled with specific precautions and disposed to designated facilities for that purpose. So, before dumping the toxic material into the nearest metal container, you should consult the law of your country first. There is also a possibility of arranging skip services for the communal toxic waste disposal. This kind of a municipal management would require organized and pre-arranged collection days for households. If there is a need of a third-party service for your community, make sure you hire a completely certified service provider that follows legislation policies in the field of environmental protection and safety measures. #3 As a construction firm, we deal with a lot of debris on a regular basis, but we just can’t seem to find the right containers to cover all the waste. What would you suggest? Finding the one-size-fits-all kind of a solution for an efficient waste management might just not be that easy, especially when you are constantly dealing with a different amount of solid waste. Therefore, you might want to consider several different containers in order to manage all the debris and fit all your professional needs. Depending on a scale of a construction, you could benefit from a wide range of metal waste containers. For example, if the amount of waste isn’t too big, skip containers can be a good idea. These are suitable for demolition materials, a collection of metals, and various packaging materials. On the other hand, if you are dealing with a much larger volume of waste, you might want to consider roll dumpsters as a solution. Eather way, you could think about putting several galvanized steel bins to various spots of your construction site. These are highly functional containers, easy to move, protected from corrosion, and resistant to fire. As such, these should provide maximum efficiency for your work. #4 There are a lot of parks and green areas in our urban surroundings. What kind of bins should we use to keep those areas clean and tidy? Depending on the surface area, you may consider installing single, double or even triple bins, if that would fit your needs for a waste disposal. This kind of steel litter bins may also be decorative while providing a great amount of functional, secure, and suitable features for parks, pavements, hiking lanes, but also school, hospital, or hotel backyards, bus or train stations, and other public spots. We believe that litter bins would be the perfect solution for parks, woods, and other outdoor areas. Many of those come with a built-in ashtray, which can be really convenient as an additional asset, considering that an in-door smoking is usually prohibited. #5 Our municipality wants to bring the recycling system to the higher level of efficiency. What would you recommend as the best management solution? Recycling is a truly important issue when it comes to municipal waste disposal systems. It involves disposing of waste that can be re-used for a production of new goods. Please have in mind that many households may be interested in recycling, but simply find it too bothersome to sort materials out on their own. Another problem might be that the containers intended for recycling are located too far or somehow difficult to reach. To rise popularity of recycling among your municipal population, waste containers should be better positioned in the neighborhoods and significantly easier to reach. For this purpose, we suggest considering galvanized 1700 litter waste bins, as their lid may be equipped with additional bottle, can and paper apertures. This kind of containers can be locked from moving, and therefore may be truly a safe solution for the upbringing of a municipal recycling system. We would like to hear your thoughts about these issues. Do you still have a dilemma about something? Do you have more questions for us? Feel free to raise them on our Facebook page, and if needed, we would be happy to bring you the Part 3 of a solid waste management Q&A in the future. How can steel waste containers save your project?